If you’ve yet to sail aboard the cruise line voted World’s Best more consistently than any other in history, now is the perfect time to experience our commitment to exemplary service and amazing value. We’re pleased to offer NEW Crystal guests up to $7,465 per person savings. Complimentary evening of specialty restaurant dining at least once in Silk Road or the Sushi Bar celebrating the cuisine of Nobu Matsuhisa, and at least once in Prego. Additional reservations or visits available for a modest fee*. Complimentary fitness programs with classes in yoga, mat Pilates, Spinning®, and so much more! There are a myriad of places to see, people to meet and experiences to savor. Start your adventure and begin your Crystal story now! Cruise-Only Fares apply to new bookings only as of 9/1/2016. Cruise-Only Fares are per person in U.S. dollars, double occupancy and do not include cruise port, security and handling charges of $355-$2,980. 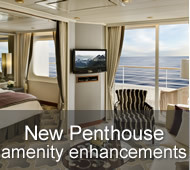 New-to-Crystal savings of $7,465 is for Full World Cruise 3 voyage (8201-8307) in category CP. 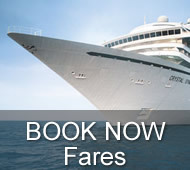 New-to-Crystal savings applies to new bookings only with featured savings applicable to lowest category available except for voyages 8201-8307 (Full World Cruise 1) and 8302-8208 (Full World Cruise 3), featured NTC savings apply to category C1 only; lesser savings will apply to lower category combinations, call for details. 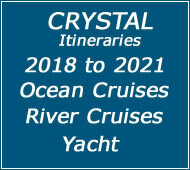 Guests must never have previously sailed on Crystal Cruises to receive New-to-Crystal savings. New To Crystal Savings (NTC) offer combinable with Group Overrides, Tour Conductor; Bonus/Share The Experience (as new to Crystal guest only, not as Sponsor); Full Payment Fares; Guest Relations Rollovers & Cruise Credits; Amex Centurion; Amex Platinum; Cruise Night Events (CNE), Crystal Agent Promotion (CAP) and National Account Amenities; Tactical Promotions; Crystal Family Memories. S3/S6 offer not combinable with Crystal Society Savings and Milestones; Onboard Booking Savings; Crystal Society Cruise Credit; Cruise Night (CNI); Crystal Getaways and other reduced fares. Optional Personal Select Air program is available from Crystal Cruises' designated gateway cities in the U.S. and Canada, and include all government fees and taxes. 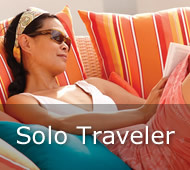 Solo Traveler Fares are available upon request. Note: Early Full Payment savings do not apply to Personal Select Air. *Crystal Cruises offers each guest the opportunity to dine at least once on a complimentary basis in Prego and at least once in Silk Road or the Sushi Bar (Sushi Bar is not available for pre-reservation via PCPC and is available on a first-come, first-served basis). Full World Cruise guests can request additional complimentary reservations including "walk-in" visits, subject to availability. For non-Full World Cruise guests, additional reservations including "walk-in" visits are subject to a $30 per person fee, per dining experience, subject to availability. **Free Wi-fi/Internet access: Deluxe Stateroom (from category E2 - P1) and Penthouse with Verandah (PH) guests will receive 60 minutes per person, per day; Penthouse Suite with Verandah (PS) guests will receive 90 minutes per person, per day; Crystal Penthouse (CP) guests will receive unlimited free Wi-fi/internet for the duration of their cruise. Restrictions apply. 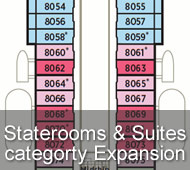 All offers may not be combinable with other promotions, apply to first two full-fare guests in stateroom or suite, are capacity-controlled, subject to availability, and may be withdrawn or changed at any time without notice.